Anyway back to my point, these legends retire and this allows for fans, media and peers to reflect on their careers and this usually makes their achievements more outstanding and also their codes of sport usually realise more what they brought to the table when they have left the sport for good. One such ‘legend’ is in danger of causing damage to his status by coming out of retirement to race again and hope to add title number 8 to his illustrious motor racing career. Yes you’ve guessed, this man is Michael Schumacher (pictured below), and I will admit I am not a fan of him as a person, he seems to come across as arrogant, though this is occasionally deemed a quality of legends. I admire his achievements in motor racing and especially his successes in Formula One. Winning 5 of his 7 titles back-to-back is a stupendous achievement, one I feel will never be matched in my life-time. Last year was a very up and down year in the world of Formula One, but this made the sport more watchable, interesting and provoked debate among non-formula one fans. I admit to not been a huge Formula One fan, though I did enjoy last season’s offerings and I feel this coming season, which is already under way will offer the sport arguably its finest season in many a year. It has many talking points, including Schumacher’s return, but with Jenson Button and Lewis Hamilton (both pictured below) driving together, the British hopes are well and truly with one team and its two former world champions. There are many great drivers to look out for and the constant changes the FIA (Formula One Governing Body) have made to the sport and the Formula One cars, thus enhancing the sport considerably, I hope this continues this coming season. 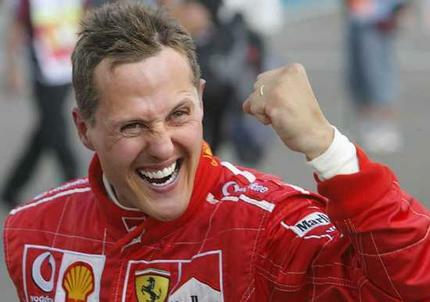 Schumacher will find it tough, especially as he is now the wrong side of 40 in a sport full of youthful exuberance. This was evident when his proposed return to the sport was halted last year due to the longevity of recovering from a neck injury. I predict him to be competitive but feel it maybe a step too far to win the championship. I predict a very close race but I have an inkling that Red Bull Renault will win the Constructor’s Championship and keep an eye out for Force India driver, Adrian Sutil (pictured below) to have a greater impact and maybe rack up his first career win. The Drivers Championship will be won by Sebastien Vettel of Red Bull Renault, he is a superb driver and this will be his natural progression to win the World Championship. I hope to be proven right but only time will tell as whether or not I am right. I think Schumacher decision to come back is not very wise for a legend to be nesting in the gale with folks that only dreams are to emulate him. I still think it can be a sensation. Am a Mc Laren fan and I think this year will be particularly a two house very close race between the Ferrari of Alonzo and the Mc Laren of Hamilton. I was unaware of your F1 interest but appreciate your points, do not discount Seb Vettel from the championship race as he has proven last season to eb an excellent competitor in one of the very few teams to remain consistant with team selections over the close season. It will be an interesting watch that much is for sure.